Kasey Niederhofer is an Associate Attorney with The Cromeens Law Firm, PLLC, where she focuses on practicing construction and business law. Within these practices, she handles a variety of matters surrounding business formation, reformation, contract drafting and construction litigation. Prior to joining the firm, Kasey was a Law Clerk with the Law Office of Robert Stone and with the Federal Aviation Administration, located in Fort Worth, TX. She earned her B.S. in Psychology from the Abilene Christian University, in 2014, and her J.D. from St. Mary’s University School of Law in 2018. 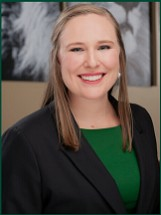 During law school, Kasey interned at the Zarka Allen Law and the Texas RioGrande Legal Aid in the Manufactured Housing Division. She also served as Cultural Affairs Chair of the Women’s Law Association.